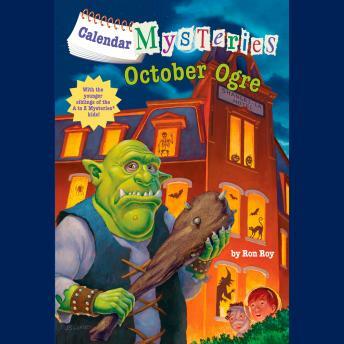 In the tenth book of the Calendar Mysteries- an early chapter book mystery series -there's a haunted house in Green Lawn! It's Halloween, and the Shangri-la Hotel has been transformed into a haunted house, complete with an ogre out front. Bradley, Brian, Nate, and Lucy are ready for some scary fun, but then they notice that none of the kids who have gone in the hotel have come back out. What's happening to them? Ghosts and witches and ogres aren't real . . . right?